There are now 31 chapters worldwide in the WikiHouse community. 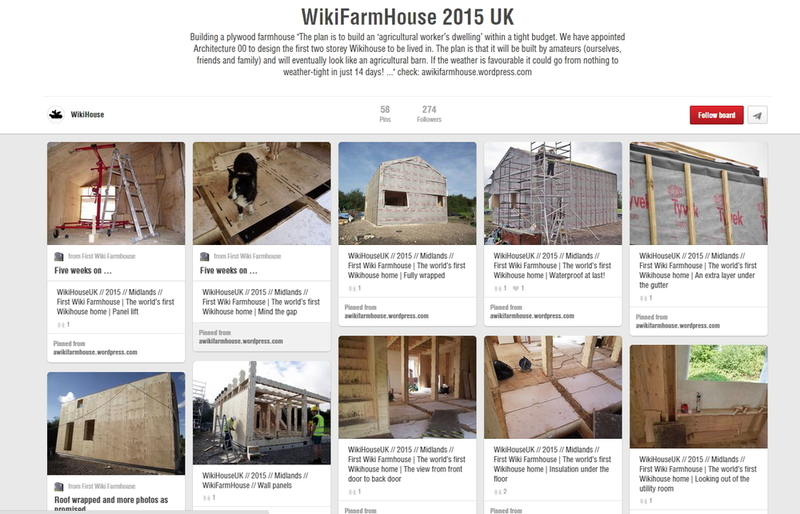 News from WikiHouse chapters around the world is being well documented on Pinterest. You can keep up to date here. The videos below also show a lively range of projects. WikiHouse's Scottish chapter is constructing a WikiCommunityHouse - a build ‘by the people, for the people’. Known as a community-use WikiHouse, the building is being constructed in Edinburgh on a temporary brownfield site in Fountainbridge owned by developer EDI. Led by the Fountainbridge Canalised Initiative and supported by EDI, the WikiCommunityHouse is an addition to the other various 'meantime' community projects, including a community garden. The regeneration master plan includes plans for 340 new homes. Volunteers ‘put the pieces together’ for new temporary community space at WikiHouseEDIN, Fountainbridge, Edinburgh, UK. The project is being chronicled at Pinterest. Building a plywood farmhouse: "The plan is to build an ‘agricultural worker’s dwelling’ within a tight budget. We have appointed Architecture 00 to design the first two storey Wikihouse to be lived in. The plan is that it will be built by amateurs (ourselves, friends and family) and will eventually look like an agricultural barn. If the weather is favourable it could go from nothing to weather-tight in just 14 days! ..." check: awikifarmhouse.wordpress.com or at Pinterest. A test assembly by WikiHouse Netherlands. WikiHouseIND[www.wikihouseind.org], is the India Chapter of WikiHouse [www.wikihouse.cc], initiated by founding partners Ankur Podder (Head of Community Conversations), Kaustav K Bose (Head of Development Operations) and Madhav Chandra Sai (Head of Creativity Factory) operating from New Delhi, Ranchi and Bangalore, respectively. The assembly procedure of a new 2-storey WikiHouse model for Innovation Centre Sustainable Building (ICDubo) in Rotterdam (Netherlands). Of all the pubs at the Fair of Rio Maior Tasquinhas in Portugal, one stands out for its construction. Called the WikiTasca, it was built from a WikiHouse design. Timelapse video of the A-frame barn being assembled in Scotland. We assembled the frame in 1 day and the whole barn was finished in just 1 week. A collaboration of Yale Forestry & Environmental Studies and staff members have created a Wikihouse (http://www.wikihouse.cc) at the Yale West Campus Urban Farm, USA. Wikihouses are built from highly modular, computer-milled plywood units, and can be assembled quickly by small teams. Produced by Patrick Lynch, Yale Office of Public Affairs & Communications. WikiHouse is a non-profit project, developing hardware and software which is open and shared in the commons, owned by everyone. This exhibition in Central London was part of the London Design Festival. SmartPly OSB3 panels have been used to help construct the Wikihouse 4.0, a prototype project. This amazing time-lapse video shows the construction of the £50,000 3D printed home for London Design Festival. In the context of the exhibition Atelier à Habiter at Z33 a group of architecture students from Hasselt University designed and built a site-specific WikiHouse module / entrance desk for the exhibition with the support of FabLab Genk. It is the first WikiHouse in Belgium. Students at the HAN University in Arnhem Thursday built a Wiki House together, first in the Netherlands. A Wiki House is a simple house whose floor plan is free to download. The building is part of the Building Innovation Lab, Arnhem, opened Thursday. Here students work with local companies to new sustainable solutions for the construction industry. Students will develop the Wiki House to energy-neutral student housing. We are building a WikiHouse here in Detroit, USA, and we call ourselves WikiHouseDET. Check us out on Facebook here: www.facebook/com/WikiHouseDET. SketchUp at the World Maker Faire, New York, in collaboration with WikiHouse, ShopBot and OpenDesk built a WikiHouse. Justyna Marc and Alastair creators of FabJam and Wikihouse, projects inside the @Ouisharefest in Paris. How WikiHouse is getting under way in Rio de Janeiro, Brazil.